Ø21 x 50 mm. Generate over three times the torque of conventional stirring bars with Thermo Scientific Komet Stir Bars, significantly enhancing stirrer performance and applications versatility. Superior mixing action at high speeds, and with viscous media. 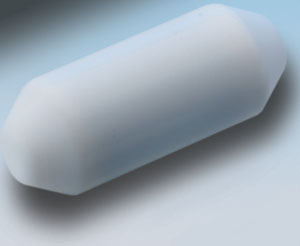 Evenly coated PTFE surface prevents residue deposits. Steam sterilizable to 121°C.